Discussion in 'Downhill & Freeride' started by Philliam, Oct 13, 2012. Been riding an old F1 for a few years and have loved every minute of it, but it finally needs to be retired. Looking to build up a new sled over the winter. Always thought I'd upgrade to a new Jedi, but Zerode has me very interested. theres quite a price difference between the two. Both bikes will love the rough, the jedi will probably jump and corner better, but the zerode is gearbox. Yeah, I know the differences in design and price. Interested in the two because of rearward travel which I have become addicted to. I like to plow and don't race or care much about weight. Just want to gobble up the trail and be smiling big the whole time. why not just buy an M9 then? Keep in mind the 400-500 saved in drivetrain. I have ridden and tested both. I import the Zerode telling you that up front. They both chow rough terrain. The rearward growth on the Zerode wasn't as noticeable in tight turns. There is less noise with the Zerode, there is less weight with The Canfield. I cannot put my finger on why but the Zerode seemed a little more poppy easier to get off the ground it could have been just the shock difference or maybe the leverage ratio or curve not sure. We used a Elka on our Jedi BTW and a Fox RC4 and CCDB on the Zerode. Demo 9 has owned both he may chime in. Thanks for the info, ianjenn. And blackohio... Thanks for your feedback/suggestions. Fwiw, I've ridden an M9 and it didn't do much for me. Probably wasn't totally dialed for me, but still. I've ridden and/or owned countless DH bikes. I've narrowed my search based on experience, preference and curiosity. buy a zerode. they are cool (so are jedis). Zerodes are wicked cool and great to ride. Zerode. Gearbox is worth it, Less maintenance, More durable, Shift anytime, Less unsprung weight. You can't go wrong with either. Good choice. Yeah, I'm thinkin gearbox. Any reco on shock? I'd probably go ccdb unless convinced otherwise. At 5'9", large or small? I know I'm asking a lot of questions, but really appreciate feedback from those in the know. Thanks. Was on med F1. First gen. Fit perfectly, but it's in frame heaven now. Get the MD/LG it is for people 5'7" and up unless you like your bikes small. I'm 5'9" and I love the small/medium Zerode. I like my bikes small though. The price difference of the Zerode and Jedi is almost nothing when you consider a chain guide, shifter, and derailer. Oh, and don't forget the cost of replacing derailers too. I have been on my Zerode for a year now. I had a 951 before that. 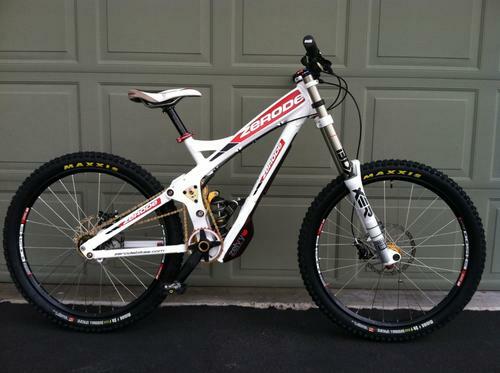 I have ridden V10, cV10, Wilson, Demo 9, Foes Fly, Slope Style, Trek, Giant, and a lot of other DH bikes. The Zerode jumps well after you get use to it. Its just as easy to pop over obstacles as my 951 and a lot better than the V10s I've ridden. It corners like no other bike I've ridden. It rolls over the rough stuff so easily. There is no slowing down or stopping when you hit square edges. I was like you and couldn't decide between the Zerode and Jedi and am soooooo glad I went with the Zerode. I get a new bike every 2-3 years and I will be keeping the Zerode for a long time, unless I buy a newer one. Zerode's customer service has been the best I have ever had to deal with. Thats not really true either, but apparently OP doesnt care about cost difference. Jedi is 3150 w/ guide. So your looking a a derailleur and shifter. The new zee can be bought for $150 for both. So $3300. Compared to the jedi's box price of $4500. Thats $1200 difference. Thats alot, in-fact thats almost the difference between buying a jedi and another used 6" AM frame or complete bike. Also, Alifne hubs arent cheap and you certainly don't want to have to replace one of those, dunno how well they've held up in the zerode's. I assume decently as you don't hear about issues. You forgot the cassette. It's 3500 vs 3300 or so both are very close. Also that includes delivery at least at this point. They ran the Alfine for 2 years no service before deciding to go that route. The Jedi is $3150... plus you need a cassette, derailer, shifter and guide. Zerodes website has listed at $4500. Well thats a different ballgame if they are going for $3500. Jedi's come with guides also, the zerode requires some small rear end parts to run a standard wheel as single speed correct? For those of you with time spent on the zee, what shock did you pick (or prefer) and why? I've loved my PUSHed dhx, but only after it was pushed. That's why I'd be willing to give ccdb a go. No it includes everything you need spacers, rear sprocket, shifter, hub. Yeah the US price is less on them! I ran the RC4, CCDB and also a proto 2013 XFUSION. The RC4 was good very easy to set-up. The Xfusion was good as well. The CCDB was INSANE where we ride it's 90% rock. Once the shock was adjusted it was killer. It took some time though. I ended up running slower HSR and and faster LSR. The compression side I used a tad more on the bottom end. Rob tried the DHX on it and didn't like it BTW. What does the zerode frame weigh? The weight isn't noticeable when riding, they ride light with the light rear end and centralized weight. Would be cool if they were lighter, but it's really a trivial issue only intergeek haters, and jealous people seem to care much about. The Zerode performance outweighs any weight concerns. I know a guy with the option to swap to the lighter frame for next to no cost who won't bother just because of the "hassle" of swapping kit over and selling old frame(they sell easy as and he knows it). jedi is pretty cool, rode 1 for 3 years. (3 for a year each*) ending with a 2012, pretty stoked with it, in may, i would have said to buy 1 no doubt, but after i got this zerode, i cant say to go with the canfield anymore, this thing is insane, you can manual in rock gardens, it jumps good, and just rides so damn good that you will smile as you ride it. It jumps awesome, and turns well, but it does take a few days to get used to, i find that i can ride the back alot more since it wont loop out. (growth?) I have been super stoked on it, and love it, i also love that i havent maintained it since hte day i got it-and dont plan to! geez why cant one for once post the weight? its not like a secret? some ppl want to know in advance what their build gonna weigh and not get told "it feels lighter"
The weight of the frame is hard to compare with other frames because of the hub. The frame, Alfine, shifter and cable, shock cover, and rear axle weigh 16.9 lbs. Maybe it's my moto X roots speaking when I say that don't mind throwing a heavy ride around. As long as it's agreeable. I didn't know the weight. Nor care. It is important too understand they ride light, more so than the actual weight IMO, so I made that point. Would be a shame if someone missed out on one because they thought it was heavy, when in fact they ride light. Unless you've ridden one, your perception of a given weight is sort of wrong. But I can understand what you're saying also. KNTRs put the weight there now. I've ridden a few now and I don't think they magically disguise the extra weight that they carry. But let's work it out. The frame, CCDB + Steel, Alfine, shifter and cable, shock cover, and rear axle weigh 16.9 lbs. For a Zerode frame weight (with no shock) that you can compare to other bikes. But the frame rides light because of weight centralisation? Let's work that out too. A conventional frame carries its additional weight at the rear extremity, derailleur + cassette = 336g in my case. The Zerode carries its additional weight higher up in the frame, and while I'd consider frame COG height to be far less important than rider COG height, it's worth mentioning. 1590g for a Alfine hub, plus mounting hardware. KNTR's weight is right. Keep in mind the tubing of the Zerode frame are 2x's the thickness of of Trek 88. His frame is version 1 of production. Tim Eaton won the Australian Elite Class aboard the ZERODE keep that in mind along with others that have won aboard the G-1. Is that including shock/spring? If so please specify parts/weights so they can be subtracted. That is with CCDB and steel spring. I use to be all about building a light bike. I had my 951 at 39lbs. My Zerode weighs 42.8 lbs with Boxxer Team. I could get it to 40-41, but I really can't tell its heavier than my 951. My Zerode is the older version too, so its about 1.5 lbs heavier than the newer version. This. But honestly this whole argument is getting out of hand. Want great suspension and no maintenance-buy a zerode, want lightweight bikes-get a conventional bike. I think the zerode is a no brainer and i am faster on it. I would never hesitate to reccomend it. I also havent had to maintain it. I love it. Just trying to provide some numbers people can use for comparison's sake. I have no doubt it rides well and can win races under a good rider, but that can be said for any decent bike these days. If anyone has a verified weight for the current Zerode (G2?) frame in M/L it'd be useful, but so far no one apart from Kntr (S/M size) has provided any actual numbers. This one on ebay is 38lb 13 oz. WOW I may nerd out on the next one. Sort of worried it's all rock here from golf balls to knee high. The Stans rims would save almost 2LBS off last build and Boxxer another 1LBS. But crap I am 210LBS and hit it all. Maybe go full nerd and build one as light as possible just for fun. Enve, Slip On Grips, MT8 Brakes, Tubelss AM/FR tires, Boxxer, Air Rear, SRAM RED chains, XTR cranks not sure what else.